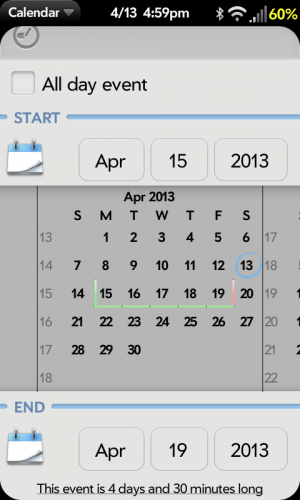 The Calendar app in webOS has some great features and Synergy in webOS makes consolidating calendars from multiple sources extremely easy, but anyone who remembers how the calendar worked from the old PalmOS days also knows that there are some major feature missing, too. While there are some patches and apps out there that can be helpful to bridge those gaps, the most complete one is UberCalendar. UberCalendar is an extremely powerful patch in Preware for both webOS phones and the TouchPad that will greatly enhance the capabilities of the stock calendar app. Among those enhancements is the ability to access a monthly calendar pop-up to select a specific date when creating or editing a calendar entry. Normally when you edit the date of a calendar entry, you have to know the specific month, date and year you want and select them from individual input fields. This can be frustrating if you want to create an entry for a specific day of the week but don't know the specific date off hand (for example, the first Saturday next month). With UberCalendar, however, you can tap on the icon to the left of the start or end date to pop up a small monthly calendar for you to choose the date you want. Today's date will be outlined in blue and you can swipe across the calendar to change months. By default, you only have access to the next few months, but you can select a different month and/or year from the dropdowns to get access to additional months. On phones, the selected starting and ending dates will be shown with green and red markers on the mini-calendar, respectively, while those dates will only be outlined in a yellow box on the TouchPad. Monday Brief: More Facebook Home, iRadio, the Lumia 720, and more! CrackBerry NYC Meetup - The Movie! LG turning to Firefox OS for developing markets, whither webOS? If you need to set an alarm on your smartphone, there are quite a few ways to accomplish this task. You can create a calendar entry at the time you need the alarm to go off, you can use third party apps like Power Nap, or you can just use the built-in functionality on webOS to create an alarm through the Clock app. Using a tool like Power Nap is great because it allows you to separate the volume level of the alarm from the ringtone volume of the phone. So even if the ringtone volume is set low, the alarm can still be very loud. However, if you want to set repeating alarms or at a time in the future and decide that the stock alarm functionality in the Clock app works for you, you may want to consider installing one of the Auto Set Clock Alarm Volume patchs from homebrew developer Djgardn2. Available for webOS 2.1 and higher (including the TouchPad), there are three patches available that will force the ringtone volume to either the 50, 75 or 95 percent level when your alarm goes off, depending on which patch you have installed. With these patches, combined with the Clock preferences setting to still sound the alarm even if the physical ringer switch is set to off on phones or the Mute Sounds setting on the TouchPad is turned on, you will always ensure that you hear your alarm when it's going off. The time has arrived; The Great webOS Nation Giveaway starts now. After much thinking we're breaking up the bounty into four segments. Each contest will have a different way to win new webOS goods. The first starts today: four AT&T Pre3s, new in their boxes! This contest goes back to an old poetic trope… yes, it's haiku time. Built in three phrases - syllables: five, seven, five - haikus are quite short. Creativity is the order of the day, keep it short, but sweet. Compose your short poem, the subject is webOS, post in the comments. Lament the shut down, plead to LG for new toys, community love. It is up to you - your haiku should capture the webOS spirit. We'll pick four winners and post them for all to read, and send them new phones. The two best haikus will also get a Touchstone and a car charger. There is a deadline: post your entry by Wednesday, 17 April. That's one week from now, so get your haiku posted, for your chance to win. There are four Pre3s up for grabs in this contest - you just need a poem. It's really not hard to write a haiku yourself - why not try a few? Five, seven, and five - poems of simple elegance, just like webOS. Heck, you might just win an AT&T Pre3. Wouldn't that be grand? Be sure to stay tuned for the other three contests - there's much more to come! Over the last few years as smartphone adoption as grown, so has the proliferation of QR codes, those square pictures that kind of look like a barcode but are a lot more complex. These codes allow people to convert any text to a simple picture that can easily be saved by simply taking a quick picture of the code and using an app on your phone to decode it. These codes can contain a website address, the contents of an entire business card, simple text or more. While many smartphone operating systems have starting to incorporate QR decoding right into the OS, webOS never quite got there. Any while there are a few different QR decoding apps available on webOS, most of them require an internet connection to work. Most, but not all. 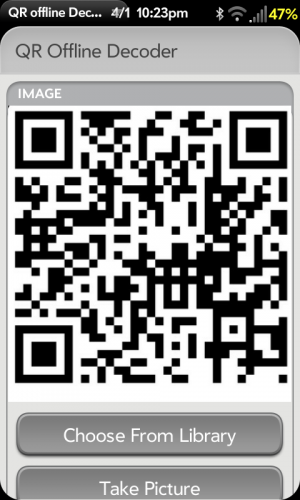 QR Offline Decoder, by Stefan Bühler, is available for all devices running webOS 2.1 or higher and does not require a data connection to work. Upon loading up QR Offline Decoder, you are presented with a photo area on top and then four buttons underneath it. Using these buttons, you can load in a QR code to the app by choosing an existing picture already downloaded on your device, taking a new picture with the camera, activating a live view of the camera to try and capture a code, or simply re-decoding the last picture loaded into the app. You own outright a perfectly good mobile operating system with years of development behind it and small but active and supportive open source and developer communities. We can understand still running with Android for your flagship smartphones for now - it's helping pay the bills and all. And we can understand that you're dedicated to putting webOS on your smart TVs and maybe other stuff later on, but we're having trouble wrapping our heads around this one… Firefox OS. Really, guys? Don't get us wrong, Firefox OS looks to be a potentially fine operating system, but it's starting from scratch. New webOS hardware might essentially be starting from scratch as far as developer support and consumer awareness are concerned, but it's had four solid years of development to get it where it is. webOS is proven to work, in spite of the lackluster advertising campaigns and gross corporate neglect and mismanagement. So LG's going forward with Firefox OS, but in keeping with the low-power hardware intentions behind the building of Firefox OS, the company plans to launch in South America by the middle of the year and eventually expand to Eastern Europe. A company spokesperson told The Wall Street Journal that "LG's planned launch of Firefox phones is a means to meet diversifying consumer needs, but this doesn't indicate any shift away from Android." Firefox OS' low-power model means cheaper handsets, which is appealing in less wealthy countries like those LG's targeting. Cheaper smartphones like old BlackBerry models and Symbian handsets have flourished in these markets while the powerful hardware needed to run the likes of iOS, Android, and Windows Phone hasn't found much traction thanks to the increased price of such hardware. We know nobody's looking for proof that LG's not planning on making new webOS smartphones any time soon, but this certainly won't help anybody's case in the matter. Android will continue to occupy the high end of LG's smartphone business, while Firefox OS is set to take the low end in developing markets. It's a niche that webOS could potentially fill - these are customers that aren't aware of the drama that's surrounded webOS for for much of its existence, nor would we expect them to care. It just has to work, and that's something we know webOS to do (albeit it at this point it could stand to be polished and updated a bit to modern standards). From the Editor's Desk - There ain't no party like a CrackBerry party! Smartphones of times past and smartphones of times present and smartphones of times unknown. A tablet, but of bewitched design with the ability to conjure information from afar. The conventions by which these most plentiful of tokens shall be disbursed has not yet been imparted; the Lady of the webOS requests your presense in the coming days at this same digital venue of bulletins and forums for the recitation of further instructions. Petitioners seeking pecuniary acquisition of or bartering for these charitable offerings for the citizens of the great kingdom of the webOS Nation shall be summarily denied and excoriated with severity. So endeth this proclamation from her majesty the most majestic Lady of the webOS, Queen of All She Multitasks. Open the "Clock" app on the device. Edit the alarm details, including the alarm name, frequency, time, and ringtone sound, as well indicating if you want this alarm to be enabled by default. If you select Enabled = OFF, it will still create the alarm but you will need to turn it on in the future. Your alarm will be added to a listing of available alarms. If this if your first time creating an alarm, it will obviously be the only one there. But you can add multiple alarms and then flip the ON/OFF switch as necessary to activate or deactivate it or tap on any alarm to edit it. If you want to delete the alarm, simple swipe-to-delete the alarm and then confirm the deletion. Be aware that the alarm will use the volume setting in the Sound & Ringtones app. So, be sure to set the volume at an appropriate level to ensure you hear the alarm when it goes off. There is also a setting available in the Clock app that will allow you to either use or bypass mute switch on phones or the mute option on the TouchPad, so the alarm will still sound even if the system sounds are muted. To access this setting, swipe-down from the top-left of the screen while in the Clock app and choose "Preferences" from the dropdown menu. Be sure that the "Ringer switch off" option on phones or the "When Sounds is Muted" option on the TouchPad is set how you want it. If you are a Star Trek fan and have ever owned a webOS phone with a slide out keyboard, chances are that you have been reminded of the old school communicators from the original Star Trek series whenever you slid open or closed the keyboard. If you want to take your Star Trek geekery to the next level, you need to install Star Trek Communicator, by Nate Craddock. 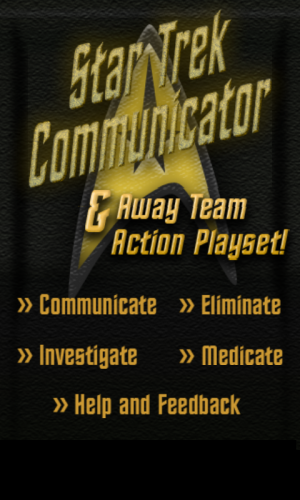 Star Trek Communicator is free in the official App Catalog and allows you to turn your phone into a communicator, tricorder, medical scanner or phaser from the original series, complete with fun animations and sound clips from the show. But where this app really shines is in the communicator mode. When you can swipe up or down on the screen to "turn on" the communicator, the app makes the appropriate activation sound and you press some of the on-screen button to hear sound clips from members of the Enterprise crew. Swipe up or down again and to turn the communicator off. The app can also activate or deactivate the communicator--along with associated beeps and sounds--by simply sliding the keyboard open or shut, respectively, assuming your phone has a slide out keyboard (in other words, you are out of luck if you own a Pixi). And with the beauty of the way multitasking works on webOS, the app does not even need to be active for it to work. So, just leave the Communicator running in the background and every time you open or close the keyboard you get to pretend that your webOS phone is from the 23rd century! Want a little extra fun with the app? Go to the phaser section and use the sliding wheel on the bottom-left of the screen to set your phaser to the maximum setting. Wait about 30 seconds and be ready for bit of a boom. Star Trek: Communicator is available in the webOS App Catalog for free and is compatible with all webOS devices running webOS 1.4.5 or higher. Live long and prosper. Monday Brief: BlackBerry Q4 earnings, a Google Watch, and the last Monday Brief ever! It's Easter Weekend. Save 15% on All webOS Accessories! Monday Brief: An interview with Thorsten Heins, HTC One review, and more!